Vrindavan, India - March 23rd, 2016: Many people enter the temple throwing gulal into the air to celebrate Holi. Vrindavan, India - March 23rd, 2016: In a similar setting to the previous photo, people celebrate by throwing gulal in the air and begin to sing songs. Vrindavan, India - March 23rd, 2016: Portrait of a child on the day before Holi. Vrindavan, India - March 23rd, 2016: Portrait of a young boy on the day before Holi. Mathura, India - March 24th, 2016: A boy throws gulal to celebrate Holi. Mathura, India - March 24th, 2016: Kids gang up on one of their friends during Holi festivities. Mathura, India - March 24th, 2016: Kids play in streets making a mess on the day of Holi. Mathura, India - March 24th, 2016: A boy poses for a portrait in-between gulal throwing. Vrindavan, India - March 23rd, 2016: A man is covered with color on the day before Holi actually starts. Mathura tends to get very festive weeks before Holi. Mathura, India - March 24th, 2016: Young boys are part of a festival brigade. Mathura, India - March 24th, 2016: The festival brigade continues. 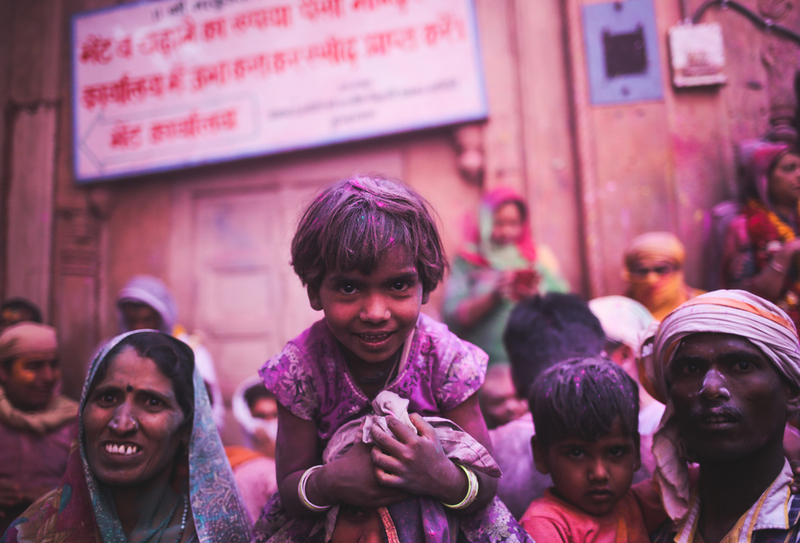 Mathura, India - March 24th, 2016: The kids love the festivities on Holi. Mathura, India - March 24th, 2016: Two friends hug after getting gulal powder thrown all over them by strangers at one of the major spots of festivities. Mathura, India - March 24th, 2016: A young boy poses after getting hit by gulal from his friends. Mathura, India - March 24th, 2016: A man walks towards a fire towards the end of Holi. Mathura, India - March 24th, 2016: Two young boys take a break after a long day of Holi celebrations. Mathura, India - March 24th, 2016: A young boy is done with the day as he poses for a photo after Holi.